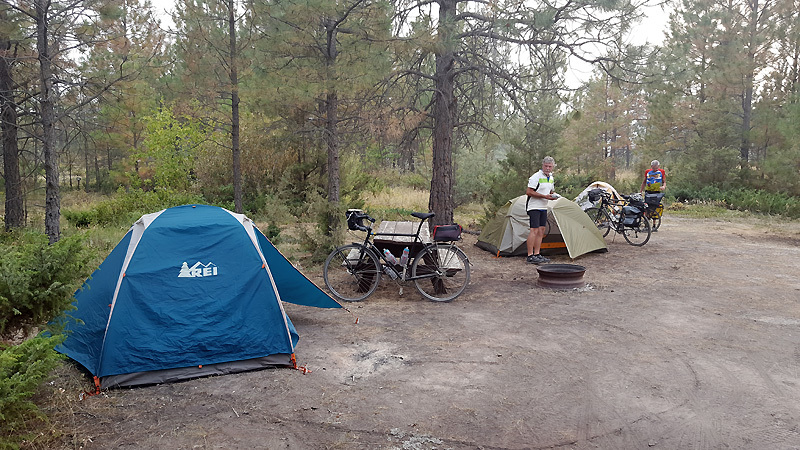 They complained that Jack’s tent, located well off their setup, possibly encroached their campsite, that their boundary was defined by a tree they arbitrarily selected, so he shouldn’t be there. They played bad music. Quiet hour at this campground didn’t start until 11pm, so we all endured (me with earplugs in but I could still hear every vapid syllable). VERY uncool campers. Oh well, it’s a free country and you never know what you’re going to get. They did quiet down and we all eventually got some solid sleep. The morning feels good. It’s a whole lot warmer. Riding leggings aren’t needed for the first time this tour. Pop Tarts and a bottle of Starbucks ice coffee. Getting my AM caffeine fix feels good too – I didn’t get one yesterday. We RIP down the 1.5 mile hill from camp. 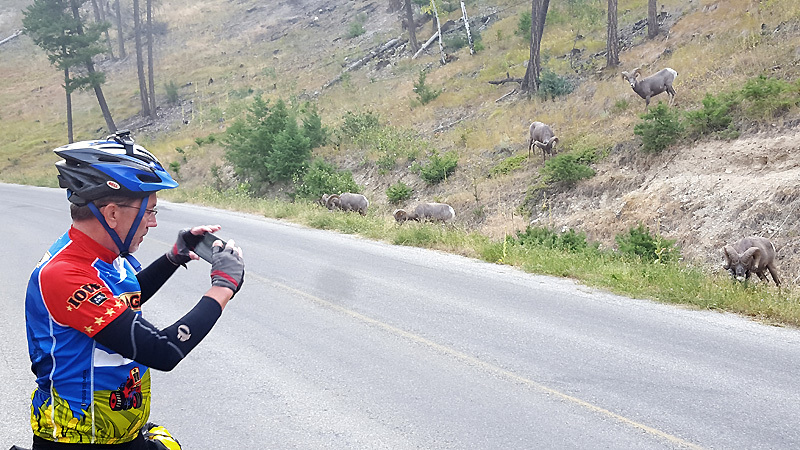 Jack gets out in front and somehow misses 6 bighorn sheep perched on the left shoulder of the road. 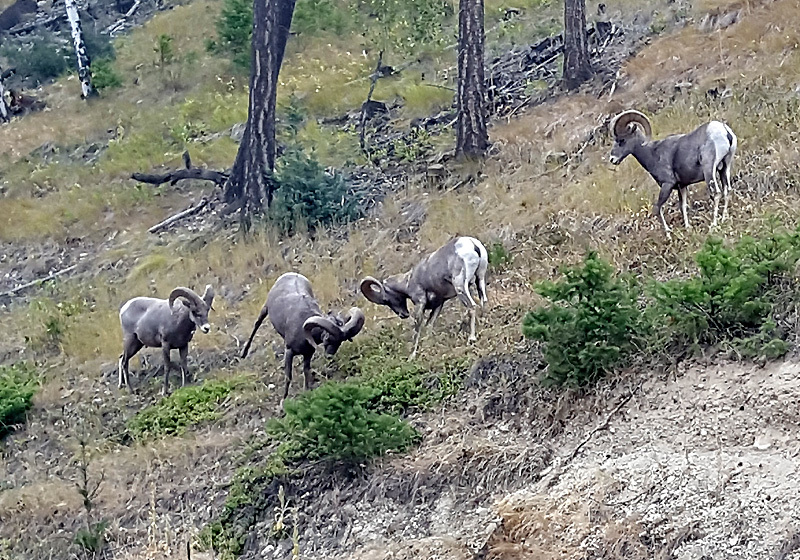 Phil and I stop and actually see two of them ram heads, you know, like in a Nat Geo documentary. Very cool – wish Jack had seen them too. 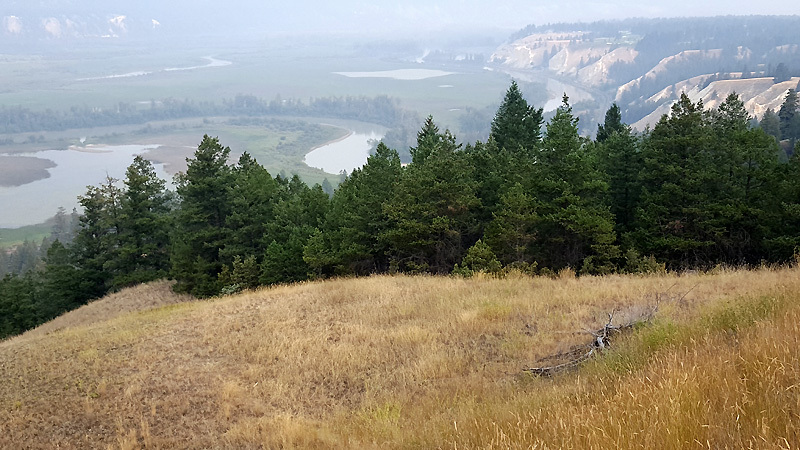 The beautiful Columbia River Valley wetlands greets us to the immediate south of Radium Hot Springs. 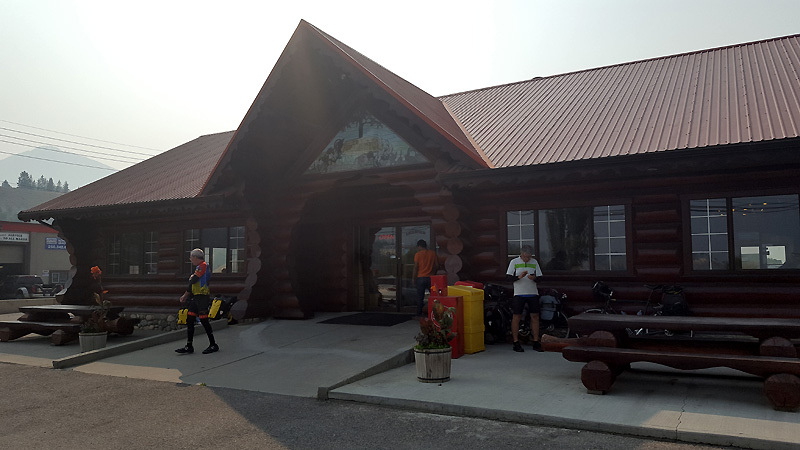 The air is still smoky but the breathing seems OK. We’d decided to breakfast in Invermere just 8 miles away, but a minor navigation error has me blow right past the turnoff. 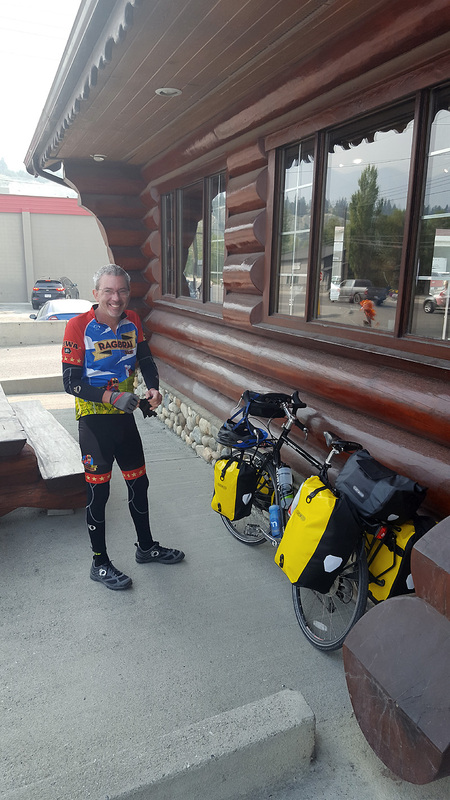 After a mile I sense the mistake and stop to regroup, and we soon backtrack to town, fly down a hill to cross the Columbia River, and find Huckleberry’s Family Restaurant. 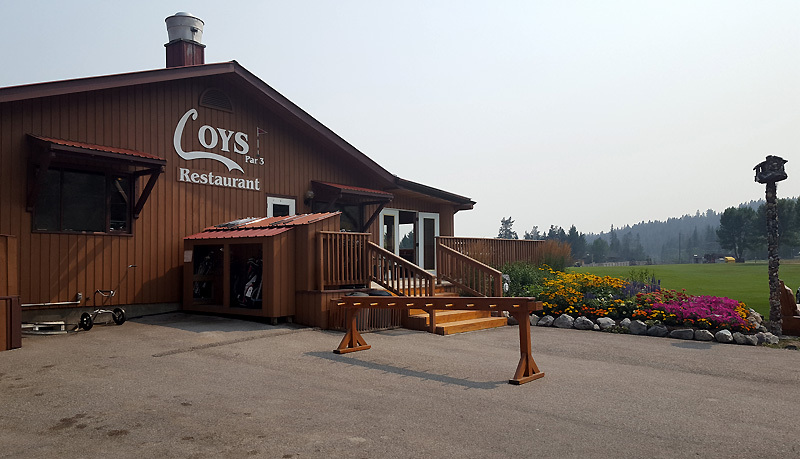 Good food and and good service – coffee 2 eggs, ham, 2 pancakes, and soon enough I’m stuffed. The server recounts meeting cyclists from Cincinnati yesterday. The route bypasses the highway for a while, instead taking secondary roads on the west side of the Columbia River. It’s a decaying bumpy road with almost zero traffic. We get a few more hills than the highway, but nothing to compare with the previous 5 days. Back onto 93/95 for a mile or two, where the riding is smooth on a wide shoulder but fairly uninteresting. 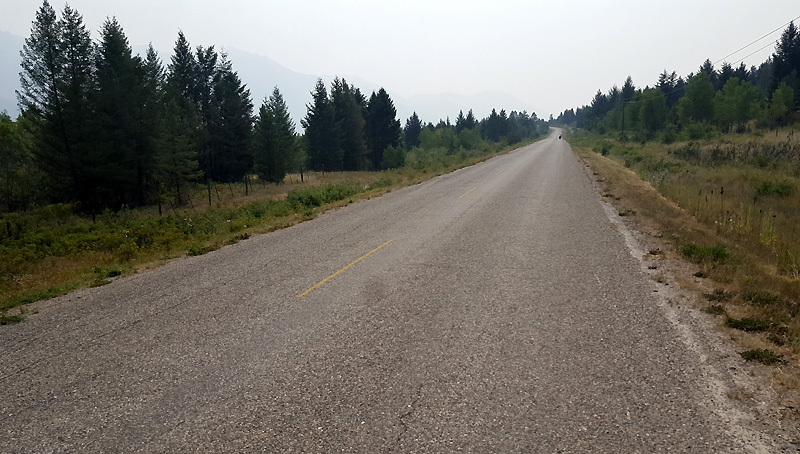 Then another deviation onto Columbia Lake Road. One of the first sights is a bright green par-3 golf course named Coys, and suddenly I have an itch to hit a bucket of balls. Phil’s given up golf years ago, but maybe Jack will join me. 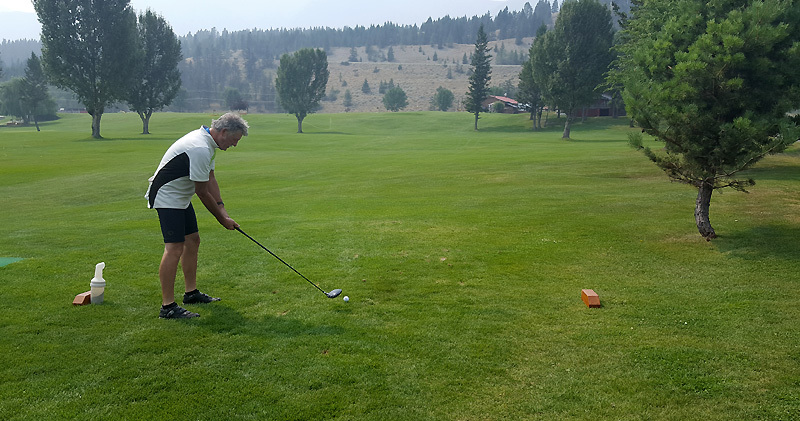 Jack is more than game – and even offers to play 9 holes. Excellent! Phil says he’ll sip on beer while we play. 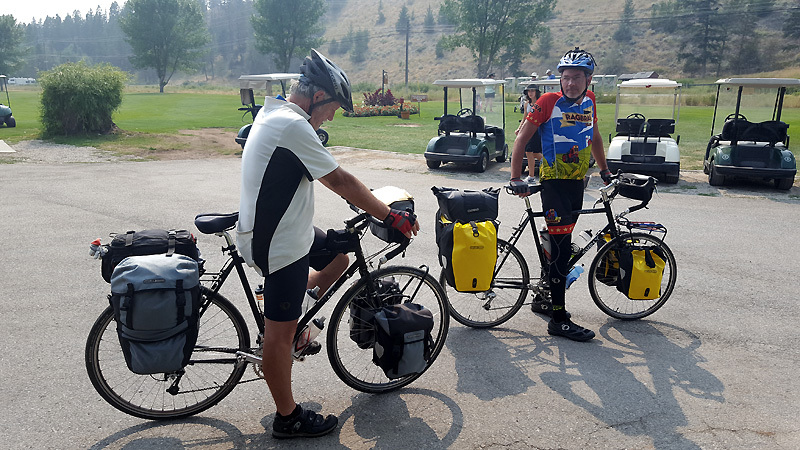 We check in and rent clubs, and we offer to put on golf shirts if we have them, but the course manager says, “Nah, your bicycle clothes are fine.” Love it. 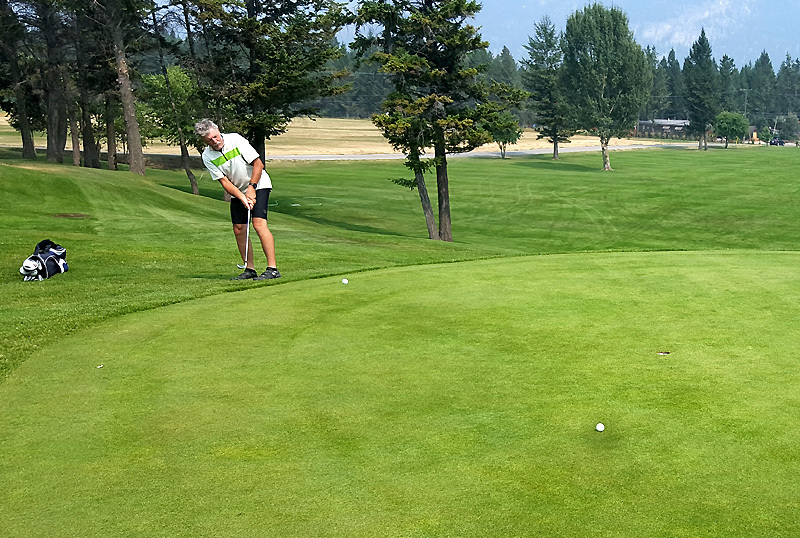 We decide to putt a few on the practice green and it’s a good thing. Jack pulls out his putter to find it left handed. 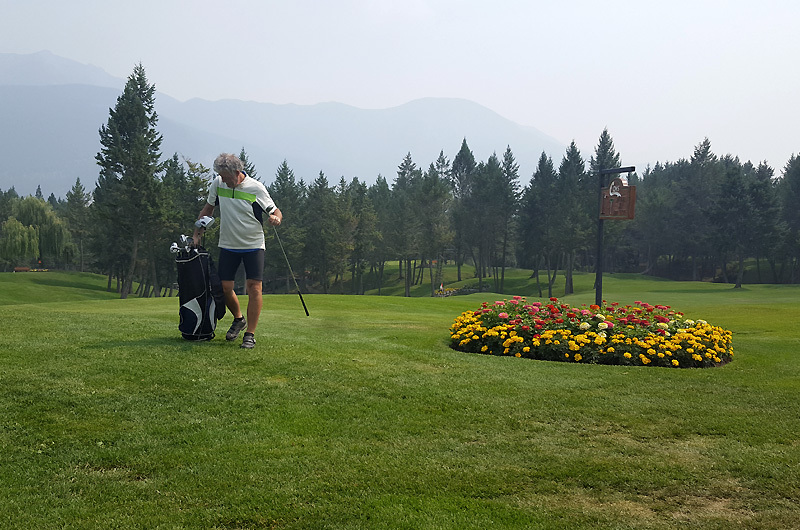 He examines the rest of his clubs and finds his 7-iron is LH too. Man! Both sets are mix-and-match. I’ve got a driver and hybrid and a few irons, but no fairway woods, no 7-iron, no PW. Jack has driver and fairway woods but no hybrid, and a similar off-mix of irons. We’ll share clubs as needed. We step up to the first tee. Another golf group spies us in our cycling clothes and jokes that we should speed golf the course, sprinting each hole. It’s funny how people associate bicyclists with tri-athletes, but it’s mildly flattering. We decide on handicapped match play, playing for honor. It’s a fun little layout, some holes wide open and others narrowly threading through tall trees with elevation changes. I mis-hit my tee shot on #3 and end way down in a hollow next to a pond, with the green well above me. I holler out about receiving 10 mosquito bites during my stroke, and a nearby greenskeeper wonders aloud how it was only ten. I’m up 2 with 2 to play but Jack wins #8 to cut it in half. Number 9 is 230 yards long and Jack’s got a pop. He’s 2 yards off the green in 3 while I’m sitting 5 feet from the hole in 2. Match over, right? Jack states that he’s going to sink his chip, then masterfully does so for his 4. Of course, I miss my putt to square the match. What a great shot and great way to end it! It’s only another 8 miles to our planned overnight in Canal Flats. 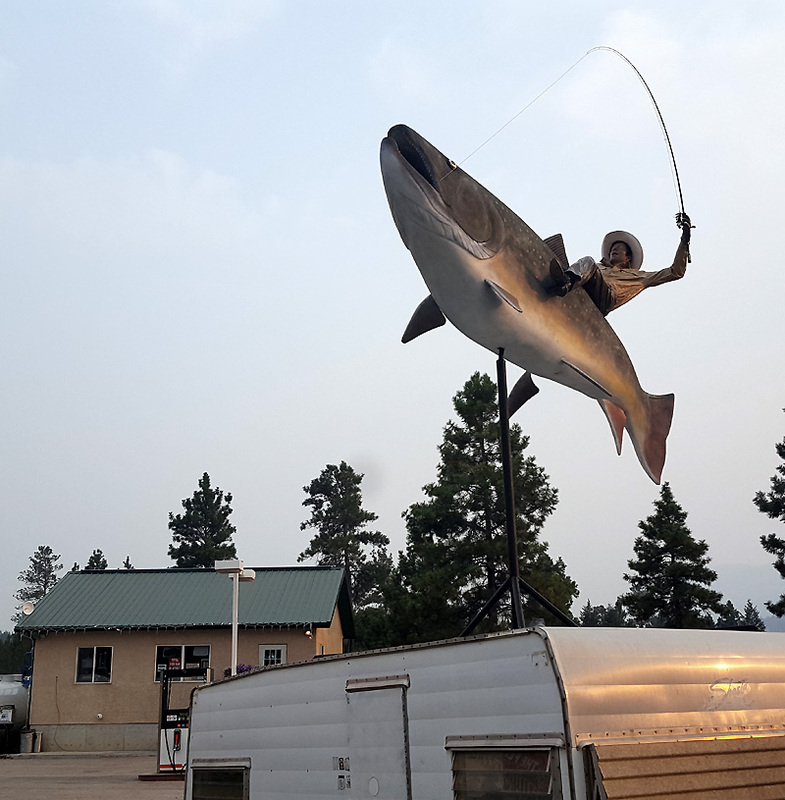 We check in at The Flats RV and Campground. Spinning around the grounds, we find the driest dustiest campground I’ve ever seen. Many dozens of sites appear open but most are marked “Reserved” for various parties. We finally learn that the signs are left over from a previous wedding – no worries. 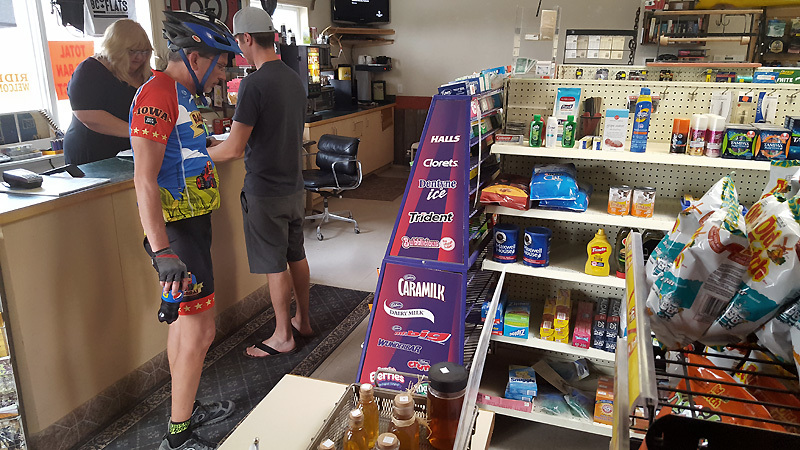 The place has a c-store as part of the business – quite convenient. We sit around a while, devour a bag of cheese pops, and set up our tents. 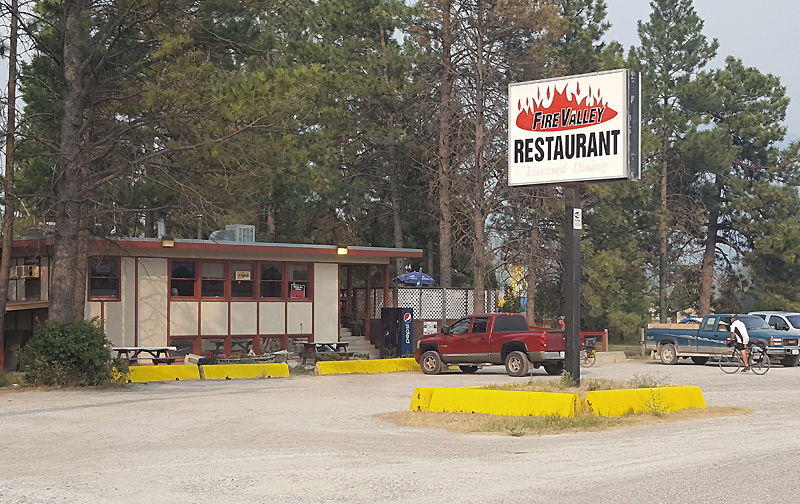 For dinner, across the street is the Fire Valley Restaurant, woefully run down (you might consider replacing the carpet) but with attentive service and pretty good eats. Phil fills on liver and onions while I dine on a sirloin and Caesar salad. Jack enjoys the veggie burrito (thought I’d forget?). Both the server and cook are nice dames and we chat for a while after dinner. Phone home and then a shower. Both are wonderful. It’s a nice warm evening but already getting cooler. Going to be a fine night to tent – again. I’m hoping we are done with 40F mornings, but we’ll see. Views are still half opaque but I can’t smell smoke. Again, I can’t believe how BONE DRY it is here – all these pine trees must be struggling.